Oil Rubbed Bronze w/amber 3 Light 9in. Cast Aluminum Wall Lantern from the Sedona Collection | Fountain City Art Ctr. 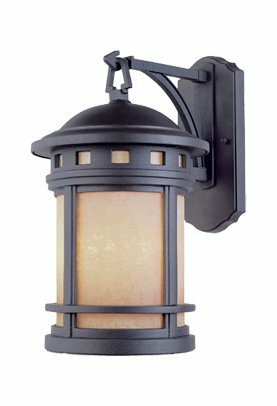 This Three Light Wall Lantern is part of the Sedona Collection and has an Oil Rubbed Bronze Finish and Amber Glass. Type of Bulb: Candelabra, Wattage: 60.